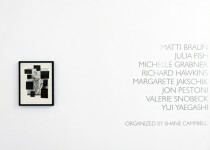 Federica Schiavo Gallery is pleased to announce a group exhibition organized by Chicago gallerist, Shane Campbell. The show will feature work by Matti Braun, Julia Fish, Michelle Grabner, Richard Hawkins, Margarete Jakschik, Jon Pestoni, Valerie Snobeck and Yui Yaegashi. 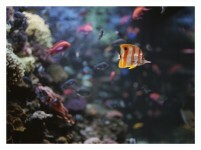 The exhibition begins with Rome in the work of Fish and Hawkins. Three gouache and flashe works on paper by Julia Fish present the profiles of the various types of steps in the American Academy in Rome. As a visiting artist at the Academy in 2007, Fish’s direct experience of the stairways and steps in the McKim, Mead, and White building, “became a primary reference and focus, and initiated questions about the next approach that might be taken in translating, and thus representing, transitional architectural space,” writes Fish. Her works are generated from observation and measurement of the steps thus intimately connecting them to their site in Rome. Richard Hawkins’ collages are from a group of work including small-scale ceramic sculptures of hermaphrodites initiated by his experience of seeing the small hermaphrodite sculpture in the Hall of the Doves in the Capitoline as well as the Sleeping Hermaphrodite at the Villa Borghese. These collages eventually led to his Urbis Paganus project that focused on Classical sculpture whose backside was as important as the front. All four of the collages feature an abstract overlay that refers to Hans Arp’s Dada collages and for Hawkins are refusals of representation. Hawkins’ abstract collages acknowledge and refute the role of “chance” in Arp’s arranged collages, thus they straddle the metaphysical and the material world much like Matti Braun’s silk paintings. 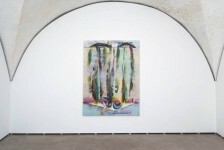 Braun’s ongoing group of dyed silk paintings are located both in the physical world of “artsy” hand-dyed silk women’s clothing and the metaphysical realm of Finnish origin myths as the formless swirling colors suggest a world coming into being. 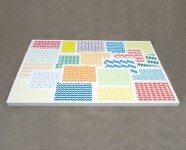 Grabner's paper weavings and Yaegashi’s intimate paintings locate themselves in the world through the language of the grid and domestic abstraction. Michelle Grabner’s weavings are simple craft exercises of woven paper that resemble kitchen textiles, placemats, or other forms of domestic design. As individual works they exploit the endless permutations of pattern through color, line or pick weight, and the warp and the weft. As an installation, the works occupy the space of the floor, much like Carl Andre’s metal plains, seizing and activating the floor of the gallery as a woven paper quilt. Yui Yaegashi’s paintings are visually slow and frustrate viewing as she frequently obscures and cancels sections of each work. 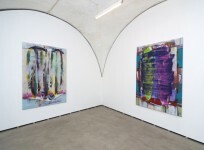 Formally rigorous, their small size belie a poetic abstraction, however each painting refers to Japanese textile patterns, sampled and recontextualized as unique, sensuous objects. Jon Pestoni’s work engages painting as an event within which to act. The visual compression of each painting prevents them from ever becoming pictures or non-objective abstractions and Pestoni further complicates viewing through the use of contradictory information that resists harmony to forward dissonance. 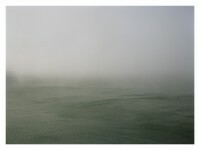 Jakschik and Snobeck contribute photographs albeit from different conceptual positions. 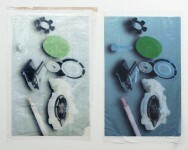 Valerie Snobeck’s laminates are peeled plastic images from photographic prints. The work in the exhibition is a diptych that features the same images but in different stages of image transfer which reveals a continually degraded image with each subsequent transfer. The image itself is taken from Wikicommons and the gears reinforce the materiality of the work itself as plastic which is adhered directly to the wall by heat transfer, consequently fusing the image and the gallery. Margarete Jakschik’s photographs are conventional works in their printing and presentation and it is her sensitivity that underscores the poetics of the everyday. Matti Braun was born in Berlin in 1968 and lives and works in Cologne. He studied at the School of Fine Art, Braunschweig between 1989 and 1996 and at the Academy of Fine Art, Frankfurt am Main. His recent solo exhibitions include Gost Log, Arnolfini, Bristol, 2012; Ave Vala, BQ, Berlin, 2012; Sola, Galleria S.A.L.E.S., Rome, 2011; Salo, La Galerie, Noisy-le-Sec, 2010; Salo, Kunstverein Braunschweig, 2010; Pierre Pierre, Esther Schipper, Berlin, 2010; Kunstmuseum Liechtenstein, Vaduz, 2009. Julia Fish was born in Toledo, Oregon in 1950 and lives and works in Chicago. Fish’s paintings and drawings have been included in curated exhibitions at the Museum of Contemporary Art, Chicago; the San Francisco Museum of Modern Art; the National Academy of Design, New York, NY, the Chicago Cultural Center; the David and Alfred Smart Museum, University of Chicago; the MAK Center for Art and Architecture / Schindler House, Los Angeles; and the Martin-Gropius Bau, Berlinische Galerie, Berlin, among many others. Her work has been presented in twenty solo exhibitions since 1980, and was the subject of a ten-year survey exhibition at The Renaissance Society at the University of Chicago in 1996. Michelle Grabner was born in Oshkosh, Wisconsin in 1962 and lives and works in Oak Park, Illinois and Waupaca County Wisconsin. She is a Professor and Chair of the Painting and Drawing Department at The School of the Art, Institute of Chicago. She is represented by Shane Campbell Gallery, Chicago and runs The Suburban and The Poor Farm with her husband Brad Killam. She will co-curate the 2014 Whitney Biennial at the Whitney Museum of American Art. Her work is included in the permanent collections at the Walker Art Center, Minneapolis; Museum of Contemporary Art, Chicago; MUDAM - Musée d’Art Moderne Luxemburg; Milwaukee Art Museum, Milwaukee, Wisconsin; Daimler Contemporary, Berlin; Smithsonian American Art Museum, Washington DC, and the Victoria and Albert Museum, London. Richard Hawkins was born in Mexia, Texas in 1961 and lives and works in Los Angeles. 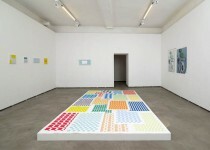 He was the Fall 2012 Guna S. Mundheim Fellow in the Visual Arts at the American Academy in Berlin. Recent solo shows include Richard Hawkins: Third Mind, a mid-career survey at The Art Institute of Chicago that travelled to the Hammer Museum, Los Angeles, and Of Two Minds, Simultaneously at De Appel Center for Contemporary Art, Amsterdam. His work has been exhibited at institutions such as Museum of Fine Arts, Houston; CCS Bard Hessel Museum of Art, Annandale-on-Hudson, NY; Museum of Contemporary Art, Los Angeles; Astrup Fearnley Museum of Modern Art, Oslo: and Museum of Modern Art, New York. Margarete Jakschik was born in Ruda Slaska, Poland in 1974 and lives and works in Cologne and in 2008 in Los Angeles. 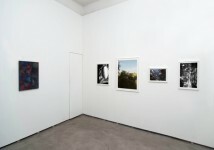 Shows: Christian Flamm – Margarete Jakschik, Galerie Karin Guenther, Hamburg, 2012; Either / Or, Broadway 1602, New York, 2011; It Will Take A Long Time, Galerie Gisela Capitain, Cologne, 2010; D.o.m.a.i.n.e .d.e K.e.r.g.u.é.h.e.n.n.e.c, Centre d'art contemporain, Bignan, 2009; When Was It Ever Like It Is Now, Broadway 1602, New York, 2008; Pardon My Heart, Galerie Gisela Capitain, Cologne, 2006, with a catalogue. Jon Pestoni was born in St. Helena, CA in 1969 and lives and works in Los Angeles. 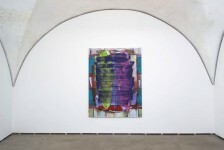 His paintings have previously been seen in exhibitions in the United States and Europe, including shows at Shane Campbell Gallery, Chicago and Lincoln Park; David Kordansky Gallery, Los Angeles; Nieuw Dakota, Amsterdam; White Flag Projects, St. Louis; and Greene Naftali Gallery, New York. He was also featured in Vitamin P2, published by Phaidon in 2011. Valerie Snobeck was born in Wadena, Minnesota in 1980. She received her MFA from the University of Chicago in 2008, and a BFA from Saint Cloud State University, MN in 2003. She also studied at Palacky University, Olomouc, Czech Republic. She has had solo exhibitions at Le Consortium, Dijon; Galerie Catherine Bastide, Brussels; Thomas Duncan Gallery, Los Angeles; University of Delaware Art Museum; 8 rue Saint Bon, Paris; Renwick Gallery, New York; and Essex Street, New York. Yui Yaegashi was born in Chiba, Japan in 1985. She is presently based in Saitama. A BA graduate of the Tokyo Zokei University, Department of Painting in 2009 and MFA graduate of Tokyo Zokei University, Graduate School of Art and Design in 2011. 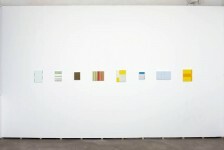 Yaegashi has participated in several group exhibitions. A selection includes FUYU NO TABI, Shane Campbell Gallery, Chicago, 2012; artist Fuminao Suenaga's curated exhibition SSS - Expanded Paintings, MISAKO & ROSEN, Tokyo, 2010; Truth - Art in the Poor Age, hiromiyoshii, Tokyo, 2009.